CURTIS, Charles (1860 -1936) was an American attorney and politician, who served as the 31st Vice President of the United States from 1929 to 1933. A signed photograph with endearment, To. 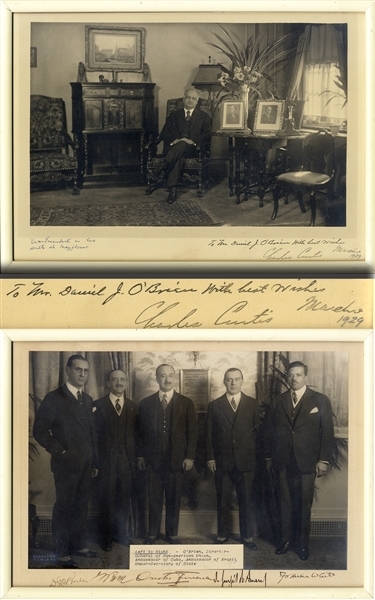 Mr. Daniel J. O’Brien, With Best Wishes, November 1929, Charles Curtis” showing Vice President Curtis in his suite at the Mayflower Hotel. O’Brien leased a 10th floor suite in this luxourous Washington Hotel for his entire term. ... plus, another photograph signed in the margin by O’Brien, and four other gentlemen. Both framed and VG.